The quality of our services depends on the quality of our staff! That is why FREE values individuals who are committed to their jobs and interested in advancing in their careers. Our administrators place a premium on hiring people with potential, providing top quality training and recognizing individuals who can work within the FREE team. Together…Creating the right solution for any need. That is our vision. If you would like to be a part of an organization that is devoted to helping individuals with disabilities realize their full potential and prevail over life’s challenges, we would like to hear from you! There are many opportunities to advance your career within the FREE Network. The knowledge and skills learned as a Direct Support Professional provide a strong foundation for the Human Services, Psychology and Nursing professions. Through the tuition reimbursement program, Family Residences and Essential Enterprises, Inc. supports eligible employees who wish to improve their job skills or develop future job skills by assisting them with the cost of tuition and/or certification programs. Gives you an easy and effective way to save for retirement. There are many advantages for the employee to participate in the plan including: Employer quarterly match, Annual discretionary employer contribution. We offer a comprehensive major medical and prescription with Emblem Health. Our major dental benefits are bundled with your major medical at no additional cost to you. We also offer a complementary employer funded Health Reimbursement Account [HRA] program for some out of pocket costs. Full-time and part-time team members will accrue both vacation time and sick time. Accrual rate will be prorated based on your authorized weekly hours. $100 Reimbursement for eligible employees. Each Year, FREE partners up with two other local human services agencies, Federation of Organizations and SAIL, to compete for the title of Color War Champion! Events range from feats of athleticism and coordination, to battles of intellect and creativity, to competitions of culinary expertise. No matter what your strengths are, there is something for everyone. Many of our Valued Team Members describe the day, hosted in beautiful Eisenhower Park, as an “Adult Field Day”. Join our team and help FREE hold on to the First Place Title for yet another year! Here at FREE, we care about our Valued Team Members. Over the past several years, concerned team members have consistently supported the needs of some of their colleagues, with donations of food, gifts, and gift cards. Each Year, Treasure Town helps many of our Valued Team Members by providing donations during Thanksgiving, Christmas/Hanukah, Easter/Passover, and Back-to-School. Additionally, there are numerous emergency requests from families who are hungry and/or homeless. When you join our team, we want you to know that this is more than a job; you also become a member of the FREE Family! We take great pride in being able to call FREE a "Learning Organization". With countless learning opportunities including online courses and in person workshops, beyond mandatory trainings, we offer our Valued Team Members the opportunity to learn about topics that truly interest them! We are also so proud to announce our new partnership with Stony Brook School of Professional Development. This collaboration has allowed us to take our commitment to education one step further by offering a Graduate-level degree, from a prestigious institution, to our dedicated team members that is both affordable, convenient, and accommodating of their busy schedules! What I have appreciated about working at FREE is the opportunity to improve my skills and advance my career. The organization is large enough to offer new positions all the time. There are training and education opportunities that have really helped me move forward. Carmen has been part of the FREE family since 1994! This job is challenging at times, but seeing the individuals continuing to improve their skills and move on makes me feel good because I helped them on the process to becoming independent. 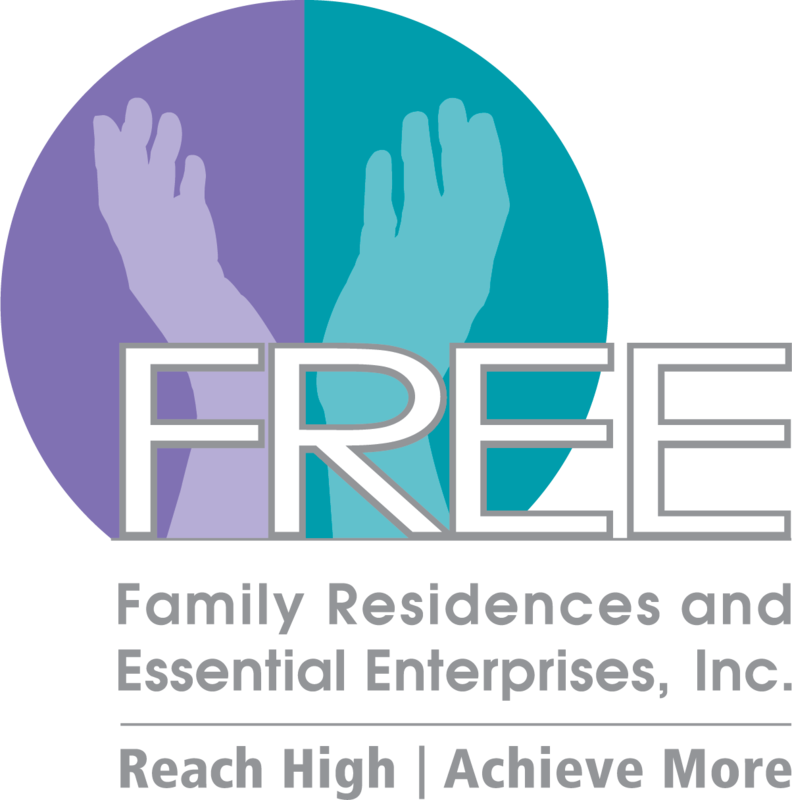 Family Residences and Essential Enterprises, Inc. (FREE) offers many wonderful opportunities to build a career. Many of our leaders started as direct support professionals. You can begin to gain the experience you will need tomorrow by becoming a direct support professional today! The foundation of our organization, the direct support professional (DSP) is a constant support to the men and women we are privileged to serve. DSP's are exposed to a wide variety of experiences that help to prepare them for careers in the medical, education, mental health, and human services fields. A crucial link between program management and the direct support team, the shift leader guides their fellow direct support professionals in supporting each individual's achievement of personal outcomes on a day-to-day basis while retaining direct contact with the men and women we support. Empathetic, charismatic, and willing to roll up their sleeves, the assistant manager is a vital resource to both the residential manager and the direct support team. The assistant manager is responsible for implementing daily activities and shares responsibility for overseeing the residence and the direct support team. The residential manager is the leader within each residence, and ensures that all of the needs of the people supported in the program are met. The knowledge, skills and abilities required for this role include staff management, financial management, project management, and managing relationships with others. The bridge between program management and senior management, operations directors (ODs) are responsible for the management and supervision of multiple residential facilities to ensure efficient and effective utilization of effective communication and consistency with policies and procedures. The assistant vice president (AVP) is responsible for the development of management strategies to meet division-wide goals, and is a primary contributor to the development of the organization’s strategic plan. A member of the leadership team, the AVP leads and inspires a shared vision based on their experience and knowledge. Reporting directly to one of the chief executives of the organization, the vice president is responsible for a particular division. The vice president plans, organizes, directs and coordinates the strategic direction of their respective division and is an active participant in the strategic planning process of the agency. The senior vice president (SVP) reports to the president of the organization and serves as a member of senior management. The SVP ensures that the proper resources are in place to fulfill the agency's mission by managing existing resources, understanding our field's direction and cultivating new opportunities for those we support. Your primary role as a Direct Support Professional is to provide balance and care to encourage the dreams of the individuals we support. The duties of your employment will be as endless as the aspirations of those who you will care for. Together you will grow as you assist them in the identification and realization of both daily and yearly life goals, simultaneously advocating for their health and safety while enabling them to overcome barriers and to establish their own networks and roles within society. As a Community Habilitation Specialist, you are both the key to and the safety net from the opportunities and pitfalls of independent living. As a facilitator of social balance, you will simultaneously ensure the health and safety of the individuals you support while supporting their active involvement in the community, and advocating for the fulfillment of their needs. Your role as a Community Support Specialist is both that of a teacher and a confidant. Steady in your support, you will help to provide stability to the individuals you assist by providing daily training in independent living skills and ensuring maintenance of psychiatric stability. As a highly organized and skilled communicator, you will enable effective interactions between the individuals whom you serve and all of the other people involved in their treatment, including other team members, family members, and the general community. As a Behavior Intervention Specialist, you will be challenged to analyze and recreate innovative programs of intervention and prevention which will allow the individuals you support to progress further into the depths of their potential. By creatively redirecting and ensuring the minimization of targeted maladaptive behaviors, you will work directly with individuals and their support teams, functioning as the key which unlocks limitless numbers of doors that lead down the many paths to more independent living through increased social integration. As a Registered Nurse, you already appreciate the privilege that is healing and supporting those who are in need. As a Registered Nurse working directly with the individuals we support, however, you will also learn how to aid and support the healing of the mind as well as you advocate for others and encourage constant daily treatment and habilitation through a proactive and personalized approach. At times, you will step into the role of a teacher as well, using the vast knowledge and experience that your certifications have afforded you to pass on the gift of healing to your fellow care-givers. Apply to work at FREE: Start your career today!